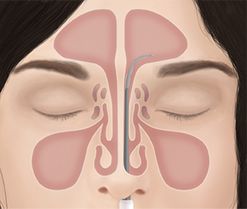 Your surgeon inserts the NuVent™ balloon into the blocked sinus pathway, using the IGS to confirm precise placement. After your surgeon confirms placement, the NuVent™ balloon is inflated and held in place for 5 seconds. After inflation, the balloon is then deflated. The process of inflating and deflating is repeated as necessary. After the procedure, your doctor may prescribe additional medications and irrigations to use to ease pain and swelling. Be sure to discuss any concerns with your doctor.